In addition to teaching classes and/or working in faculty service areas, faculty members contribute to the vibrant life of the college and engage in activities that promote a quality education and student success. Employment in the Los Angeles Community Colleges District (LACCD) brings with it an obligation that faculty will take on an appropriate share of professional responsibilities. For faculty working in the LACCD, professional development activities are required. The faculty development movement at the community college began in the 1960s due to a large influx of faculty new to teaching. As a result, time was needed to participate in these activities. In California, the 175-day community college instructional calendar was 15 days longer than in many other states and was configured in a way that the fall semester started after Labor Day and ended in late January; and the spring semester started in February and ended in mid-June. So in 1972, Cabrillo College initiated a new calendar configuration called the “4-1-4,” The fall semester was 75 days and ended before the December holidays; the winter intercession was in January, and for spring there were 80 days left. During the winter intersession, three-fourths of the faculty would teach short-term, special-interest courses, and the remaining faculty were obligated to work on instructional improvement. Faculty rotated their instructional assignments for the intersession so that all members would eventually engage in instructional improvement. The flexible calendar program was initiated by six California community colleges in 1976 as a pilot project authorized by Assembly Bill 2232 (1975). They were allowed to reduce the number of required instructional days from 175 to a minimum of 160. The bill provisions allowed the colleges the opportunity to replace up to 15 days of regular instruction with alternative activities such as course and program development and revision, staff development activities, development of new instructional materials, and other instruction-related activities. Implementation of the flexible calendar program at the pilot colleges involved reforming the instructional calendar to accommodate instruction free days for faculty development activities. The use of the flexible calendar to accommodate instruction free days for faculty development activities. 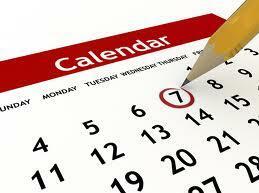 The use of flexible calendar days was accomplished through a shifting of the traditional calendar. With the success of the pilot programs, legislation (Assembly Bill 1149) was drafted in 1981 that allowed all colleges the option of adopting a flexible calendar program. 4‑1‑4 ‑ refers to a nontraditional calendar configuration where fall semester classes start in August and end in December. Spring semester starts the end of January and ends in May. This calendar schedule leaves a large block of time for development activities during the month of January. 4C/SD ‑ California Community College Council for Staff Development. Academic Work Day ‑ Number of hours during a day that a faculty member is contractually obligated to complete in performance of duties to a college (e.g., instruction, office hours, other duties). Banking ‑ Refers to the carry-over of tune spent on activities appropriate for flexible calendar beyond the number required by the institution for any one year to the next fiscal year. Evaluation ‑ To determine the significance or worth of a program by careful appraisal or study. FACCC ‑ Faculty Association of California Community Colleges. Faculty Development ‑ A process that seeks to promote professional and individual growth and development of college personnel directly or indirectly involved with students. Flexible Calendar Program Activity ‑ An activity designated as student, staff, and instructional improvement and is in-lieu-of-instruction for which the college is being reimbursed by the state. Flexible Calendar Program Day ‑ A designated day or hours out of the instructional calendar to conduct student, staff, and instructional improvement activities. Flexible Calendar Program ‑ Allows California Community Colleges to use one to fifteen days of state-mandated 175-day instructional year for faculty development. FTES (Full‑time equivalent student) ‑ An alternate unit of funding that specifies a net rate allocation based upon a workload measure as an index to determine the amount of funding a district will receive. Instructional Improvement ‑ any educationally related activity that enhances the ability of instructors to teach and students to learn. Instructional Methods ‑ Strategies for teaching and monitoring the progress of that teaching. In‑service ‑ Training going on or continuing while one is fully employed. Measurable Objective ‑ Something toward which effort is directed. NCSPOD ‑ National Council for Staff, Program and Organizational Development. Needs Assessment ‑ A survey conducted on a periodic basis to gather information from faculty, staff, and students in order to determine the importance and priority of instructional improvement activities. Personal Development ‑ Activities which promote a sense of well-being and enhance one’s personal, interpersonal and communication skills and knowledge. In addition, includes those activities leading to improved working relationships with students and staff both in and out of the classroom. Also relates to those activities which enhance an individual’s physical and mental ability to perform his or her job. Professional Development ‑ Activities which add knowledge and skills to an individual’s discipline, career, or vocation intended to improve performance on the job. These activities also provide a discipline revitalization of professional direction and focus. Seminar ‑ A formal group reaming activity convened for the interchange of knowledge, usually dealing with one specific topic. Shared Governance Mechanism or Process ‑ Refers to the locally designed process to provide the means through which all membership of the academic community‑‑students, faculty, administration, and classified‑‑can participate effectively in the orderly growth and development of the college. Staff Development ‑ A process that seeks to promote professional and individual growth and development of college personnel directly or indirectly involved with students. Teaching Methods ‑ Strategies for presentation and facilitation of learner interaction. Workshop ‑ A brief intensive instructional program for a relatively small group of people that emphasizes participation in problem solving.